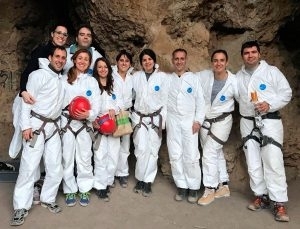 EADA is the only European business school to have an outdoor training zone at the Collbató Residential Training Campus. The purpose of this new outdoor zone is to develop management skills on installations that range between 5 and 8 metres in height. Participants learn by taking part in challenges and action games which encourage personal and shared values. There are three aspects that influence the positive results achieved using EADA’s outdoor training methodology. The first aspect is that a company’s success depends very much on the rapport, communication and engagement between its employees. When they work as a team, activities run smoothly and efficiently. However, it is sometimes difficult to get all the members of the same team on board to achieve a common goal. Each team member has differing points of view and sometimes there is one person who tries to impose their view on others. The key to success lies therefore in knowing how to work with others whose skills, ways of thinking and willingness to work sometimes differ from our own. 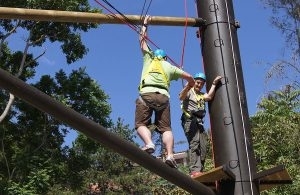 The participants take part in activities in the outdoor training zone at the Collbató Residential Training Campus which focus on action and encourage the development of skills such as self-confidence, trust in others, self-control, cooperation and collaboration as well as the ability to take risks and start new projects. The second aspect is the resulting high-performance that is achieved using these outdoor training activities. Participants work together as a collective rather than individuals doing activities which encourage synergy, collaboration and cooperation. Consequently, all the participants are capable of generating both qualitative and quantitative results which are superior to those generated by the sum of their individual efforts. A creative team is usually a group of people who is used to working in a high-performance dynamic and who put all their effort into creating, developing and implementing an idea to achieve a concrete innovation. These teams generally tend to have a shared leadership as opposed to the individual leadership of groups. They have clearly defined and specific objectives, they openly debate issues and confront opposing points of view, they measure performance more directly and there is both an individual and general responsibility. Teams therefore represent a step further in terms of cohesion among its members and efficiency when executing the team’s goals. It is a challenge for companies to have teams in key positions but if they can achieve it they will be ready to reach the most ambitious heights. The final aspect to highlight is that the activities are an effective, simple and enjoyable way to achieve an objective. These activities encourage the group to relax and aim to foster the sense of feeling and identity of a team. All the participants are evaluated by coaches who analyse their leadership capabilities, how they relate to others and their teamwork, decision-making and communication skills. There is also the added benefit that these activities take place in the natural surroundings of the Collbató Residential Training Campus. During the activities some participants will build on their leadership skills while others will improve their teamwork abilities. The skills of each participant come into play depending on the type of challenge they face. Each challenge is set up to achieve its expected results and the activities are analysed so that feedback can be given and reflected upon. It is also important to highlight that the objective of this learning experience is to be able to extrapolate the results to the participants’ daily personal and professional lives. However, to all of this we should add the final benefit which is to use the outcomes of these activities to create a road map of change which can be implemented in an organisation. Professor Sonia Gómez de Segura holds a Degree in International Management and Marketing, as well as an MBA from the ESMA Institute and a Master in Leadership and Organisational Coaching from EADA. She holds a PCC Executive Coach (Professional Certified Coach) and Team Coach accreditation issued by the International Coach Federation (ICF) with over 2,400 hours of professional experience. She has taken the Coach Supervision Programme at the Escuela Europea de Coaching, the PNL Practitioner Programme at the Gestalt Institut and the Change Agent programme at the University of Change. She is certified in LIFO and SIKKHONA methodologies and BELBIN Team Roles. Sonia has broad expertise as a judge of communication at medical meetings and in developing individual coaching processes for executives of local as well as multinational companies, and in team coaching processes. Her teaching activities have been focused on team management, leadership, effective communication, personal effectiveness, negotiation, management of emotions, executive & team coaching.